It is totally bittersweet for me to end my blog. I pay for my blog each month and it is silly for me to keep it up. I rarely post anymore and it just doesn't make sense. I started my blog in September of 2007. I posted quite regularly. Usually at least a couple of times a week. Supposedly my blog will live on after I have my account suspended. I like that it will still be there to read even if I am not posting. My masthead included a photo of my grandmother Ethel (where the Ethel of Magpie Ethel comes from) and I love those photos with my goofy sunglasses. I enjoyed my blog. I loved posting. I loved all the friends I made. It was great for my business and just wonderful for me personally to be able to share my love of vintage with so many like minded people. Fun Magpie Ethel blog facts. I had almost 20,000 comments and I tried really, really hard to reply to EVERY SINGLE ONE. I posted a weekly collection challenge where I shared a collection EACH Tuesday. I was up to 277 collections when I fizzled out on it. I wish I would have kept track of how many estate sales I went to (and so many goodies I found and took loot shoots of). As many of you know I pretty much have transferred my attention to INSTAGRAM. 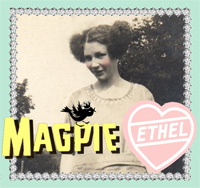 You can find me there as Magpie Ethel and still follow along on my adventures. I share a lot there. It is much less time consuming that doing a blog post. I like Instagram...if you haven't tried it you really should. Thank you to everyone who commented and read my blog for so many years. It really was a big part of my life. Time to let it go and move on. It's been a great pleasure to read your blog over the years. All the eye candy and creativity and fun! I follow you on instagram and it's been so interesting to see how you've decorated your beach house and how much fun you have junking. It's nice to know the blog will live on with archives of so much vintage goodness. Wishing you all the best and, of course, happy days! I've always enjoyed your blog and now I enjoy your IG! Thank you for so many years of wonderful blog posts - I always looked forward to them and seeing your amazing creations. Now I will enjoy you on Instagram. Have enjoyed your blog- as much as we all love IG it's a little sad to see the blogs going away. When I first came across your blog i remember thinking you were to queen of collecting! (Still do) thanks for sharing your adventures & collections through the years! I loved your blog. I hoped to see you post again. I was really excited to see activity on the blog. I am so going to miss you. I wish you continued success in all you do. I will miss your blog posts! I have resisted joining Instagram because I just don't need one more think to check.